MARCUS D LAFAYETTE REID (1 Dec 1829 – 18 May 1907) was born in Oglethorpe County, Georgia the only child of record of Bailey Reid and Hannah Washington Williams. It’s frequently asked if Marcus D Lafayette Reid, or MDL as he is often referred to, was named after the famous Marquis de Lafayette of France, or whether the name was chosen because of a possible connection to French family heritage. While we can’t say for certain, it’s most likely that MDL’s name was chosen due to the unique circumstances relating to land his father obtained in the 1827 Georgia Land Lottery prior to MDL’s birth. It’s a fascinating story presented more completely on the page dedicated to MDL’s father, Bailey Reid. Regardless of the reason for the choice of his name, it seems well-suited to our Marcus D Lafayette Reid, a man whose life was lived with courage, integrity, and dignity similar to his name-sake. MDL’s father, Bailey, left the home about three years after MDL was born, so MDL was raised primarily by his mother Hannah. 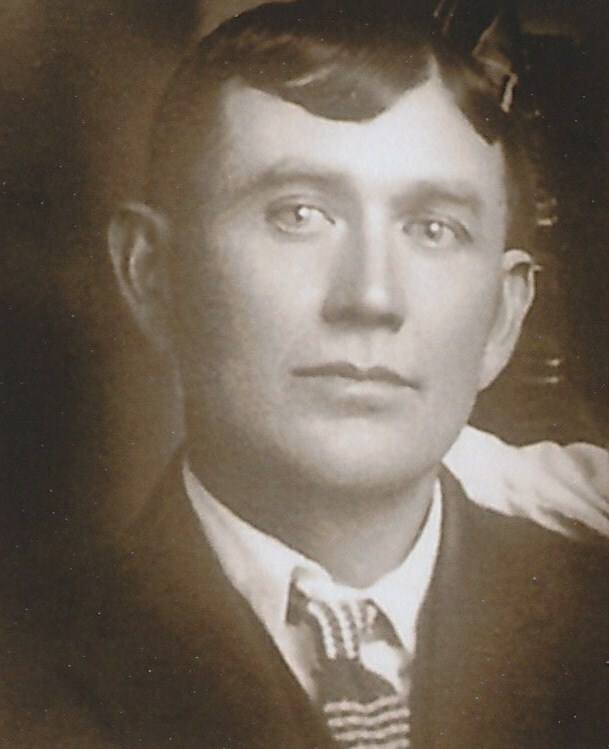 He and his mother lived in Oglethorpe County on the Williams farm with his grandmother, Lucy Williams, and uncle, Harrison Williams, where MDL learned to raise cotton. By all accounts, it was a humble existence, but MDL was loyal to his mother and grateful to his uncle Harrison for providing them a place to live and work. The rigors of farm life suited MDL well. As he labored there, he developed a keen sense of responsibility and tenacity that would sustain him through many challenges in the years to come. When he reached adulthood his physical stature emulated that of his forefathers, blessed with a strong 6’0″ frame, dark hair, a dark complexion and blue eyes. In addition to his physical and character development, MDL worked to enlighten his mind. While the humble circumstances of his youth may not have provided opportunity for formal education, we do know that MDL learned to read and write – perhaps with some help and encouragement from his grandmother, Lucy Williams, while living on the Ramsey farm. As MDL matured to adulthood he began to consider a life of his own. However, his commitment to his mother’s welfare was evidenced in the 1850 Census which revealed that, even at the age of 20, MDL was still single and living on the Williams farm in Oglethorpe County. With one eye on the farm, and the other eye on one of the Ramsey daughters living nearby, MDL was challenged to find a way to manage both priorities. He must have found a solution. On 22 Dec 1850 MDL and Nancy Ann Ramsey were married in Oglethorpe County. MDL and his new bride Nancy lived on the Williams farm after the marriage. One year later on 28 Dec 1851, mother Hannah married Benjamin Bowles, a recently widowed former neighbor who was now living in Greene County, Georgia. With Benjamin to look after his mother, MDL began to focus more intently on his own interests. In 1852, not long after his mother’s marriage, MDL and Nancy suffered their first tragedy. On 25 May 1852, daughter Preshey E. Reid, named after Nancy’s mother Prushey Bersain Ramsey, was born infirm and died one week later. Nancy’s father, Randall, was also declining in health, so MDL and Nancy moved to the Ramsey farm to assist in working the land. In spite of the assistance MDL and Nancy provided on the farm, Randall’s health continued to decline. He died sometime in 1854. Following Randall’s death, MDL and Nancy remained with the Ramseys in Oglethorpe to help Nancy’s mother and siblings manage the farm. On 30 Aug 1855, while there in Oglethorpe County, MDL and Nancy’s second daughter Ellen Reid was born, helping to ease some of the pain of the loss of daughter Preshey and Nancy’s father Randall. The 1860s were a decade of turmoil for the United States, and particularly traumatic for families of the South. MDL and Nancy were still living on the Ramsey farm doing their best to survive. Conflict between the North and South was escalating rapidly over the slavery issue. First, South Carolina seceded from the Union. 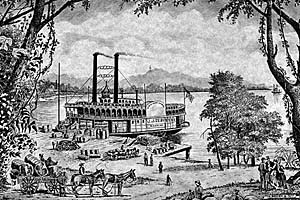 By January of 1861, Georgia became the fourth state to secede. It was not long after that the American Civil War ensued. The rebel call to service reached out to nearly every able-bodied male of the South, and whether by obligation or a true commitment to the cause, MDL responded. On 15 May 1861, MDL bade farewell to his family, traveled to Maxeys, Oglethorpe County, Georgia, and enlisted in Company K of the 8th Georgia Infantry Confederate Army. Leaving his family behind to deal with the uncertainties of war was probably one of the most difficult things MDL ever had to do. MDL’s time in service with the Confederate Army was marked by injury, infirmity, and a bit of good fortune. The 8th Georgia Infantry was a reputedly fierce fighting force and was engaged in many of the most difficult and deadly conflicts of the war, including Bull Run, Second Bull Run, Fredericksburg, Appomattox, and Spotsylvania. 387 Confederate and 460 Union soldiers were lost in the first battle at Bull Run alone. Wounded on 5 different occasions in battle during his early tenure, it was miraculous – even Divine providence – that MDL survived the war. Not long after his enlistment, MDL’s regiment traveled from Georgia to be mustered in Richmond, Virginia. There they combined with other recently mustered regiments and soon after engaged in the first battle at Bull Run on 21 July 1861. Then it was on to battle at Centerville and Washington, D.C. On 14 Mar 1862, suffering from the complications of multiple wounds and infirmity, MDL was admitted to the Chimborazo Hospital in Richmond, Virginia for specialized care. 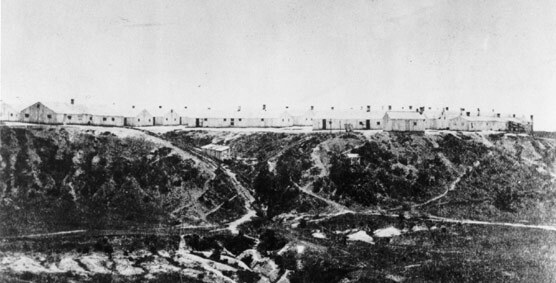 Following his release from the hospital on 12 May 1862, MDL re-joined his Company. He remained with his regiment until 2 July 1862 when he was re-admitted to the Chimborazo Hospital to treat his infirmity once again. MDL returned to duty two weeks later and remained with his regiment until late that winter when, again, he became too infirm to serve. 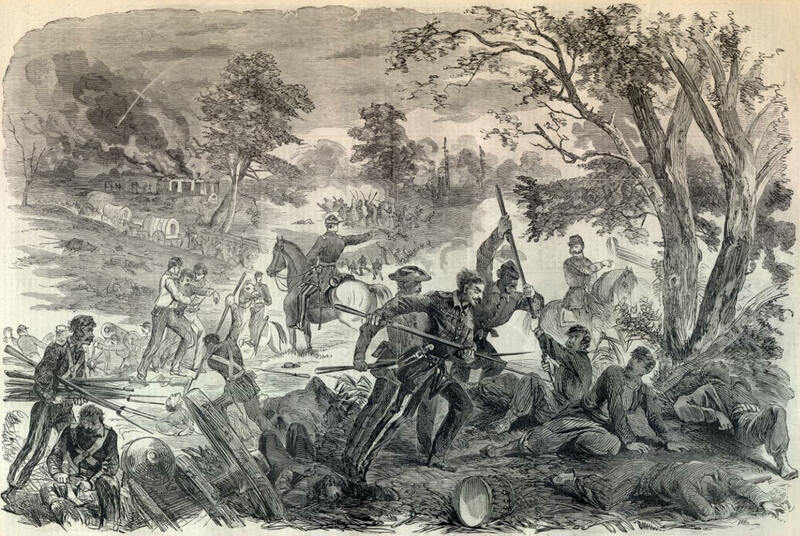 MDL’s regiment had moved southwest into Floyd County, Georgia. 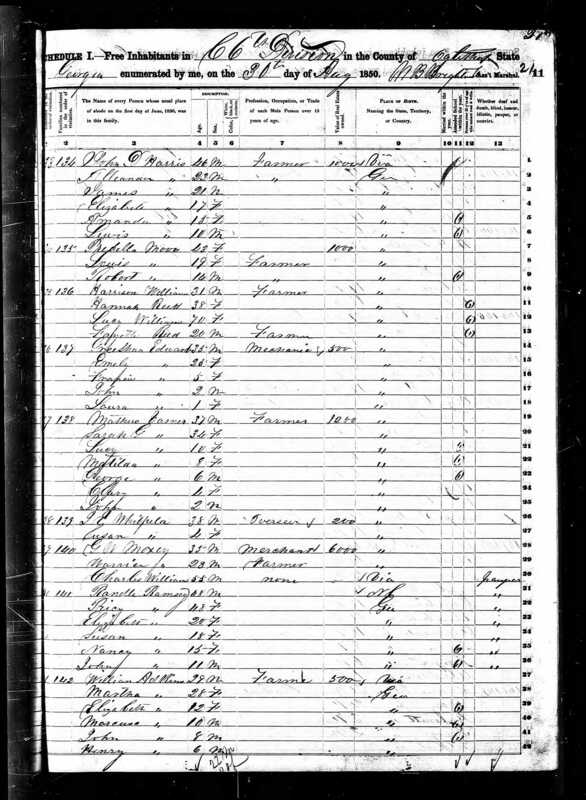 On 6 Jan 1863 he was admitted to Bell Hospital in Rome, Floyd County, Georgia for extended care. MDL spent the next nine months recuperating at Bell Hospital. As he increased in strength, MDL was assigned to the hospital muster roll and was tasked to serve as a nurse helping to care for other wounded and diseased soldiers. In his duty as a nurse, MDL developed valuable medical skills. The demand for medical care within the Confederate ranks was ever-increasing. On 14 Aug 1863, MDL was released from the hospital, but rather than joining his regiment in battle, he was instead mustered for medical duty and was assigned to serve at several other Confederate hospitals. This unexpected change in assignment proved to be good fortune indeed. Had MDL re-joined his regiment in the fall of 1863 he would have likely engaged in some of the deadliest battles of the war. For the final 18 months of his military tenure, MDL served as a nurse at Breckenridge Hospital in Marion, Virginia, and at Hood Hospital in Bristol, Tennessee. While those final months of service may not have been glamorous, they certainly kept MDL from harm’s way. Finally, on 12 May 1865, while stationed at Hood Hospital, MDL was ordered to join with his regiment in their surrender to the Union in nearby Jonesboro, Tennessee. Ten days later on 22 May 1865 – four years and one week from the date of his enlistment – MDL took an oath declaring his allegiance to the Union and was released from custody to return home to his family. MDL had been separated from home and family for four years. Knowing that the South had been ravaged by war, MDL faced a very uncertain future. As we have attempted to reconstruct the next five years of his life, we’ve pondered some obvious questions. How did his wife Nancy, daughter Ellen, and mother-in-law Prushey survive the war? Where were they now located? Had Prushy been able to hold on to the Ramsey farm? Even with the aid of family anecdotes and historical records, the answers to those questions, and many more regarding the next five years of MDL’s life, are not completely clear. Prior to commencement of the war, MDL’s mother, Hannah, and step-father Benjamin Bowles had relocated to Chattooga County, as confirmed by the 1860 Census. Benjamin was too old to enlist in the war, so he and Hannah were available to care for Nancy and Ellen while MDL was off to war. When MDL decided to enlist in May of 1861, he likely arranged for Nancy and Ellen to join Hannah and Benjamin in Chattooga County. Nancy’s mother Prushy, and her other children, likely remained in Oglethorpe County on their farm. At the time of his release from custody and oath of allegiance, MDL inexplicably declared his residence to be Floyd County, Georgia, a county which borders Chattooga County to the south. We assume that wife Nancy and daughter Ellen were still living with Hannah and Benjamin, and it is possible that Hannah and Benjamin had relocated to Floyd County by that time. However, two years after returning from war, an 1867 voter registration record places MDL as a resident of Chattooga County. Regardless of the exact location of their residence at the conclusion of the war, we assume that MDL was reunited with his family immediately after the war. No doubt, it was a joyous reunion long overdue. While MDL was able to avert personal tragedy on the battle field, he couldn’t avoid what was in store soon after his return home. The 1870 Census of Floyd County indicates that MDL and daughter Ellen were living with Hannah and Benjamin without Nancy, helping to confirm what family records maintain, that Nancy had died on 2 Aug 1869 in Alabama. The exact circumstances of Nancy’s death are currently unknown, as is the reason for her being in Alabama when she died. We know that MDL had some extended family living in Chambers County, Alabama after the war. Green Reid (Reed), MDL’s uncle, migrated to Chambers County prior to the war, and while he did not survive his service in the war, his family remained in Chambers County thereafter. It is possible that MDL and Nancy went to the Chambers area to live near family rather than live in Chattoga County with or near Benjamin and Hannah. We have learned, quite recently, that Nancy may be buried in Chambers County. We are currently pursuing that possibility through a new-found family connection in Chambers County, Debra Reed Wilson, the great, great, granddaughter of Green Reed. Regardless of the place and reason, MDL lost his beloved Nancy to a premature death, and was left to raise daughter Ellen alone. If he was living in Chambers County at the time of Nancy’s death, he re-joined Hannah and Benjamin in Floyd County soon after, as evidenced by the 1870 census. Getting on with life after the loss of his beloved Nancy Ann must have been difficult for MDL. The move back to Floyd County to join mother Hannah was necessary and helpful, but the prospect of raising daughter Ellen alone must have compelled MDL to seek the companionship of another wife. Again, as good fortune or Divine providence would have it, Joseph and Elizabeth Sharp lived nearby the Bowles farm where MDL was living. Their granddaughter, 20 year old Nancy Elizabeth Duke, caught MDL’s fancy. MDL and Nancy courted briefly, and on 11 Sep 1870, they were married in Rome, Floyd County, Georgia. Even though MDL’s daughter Ellen struggled with her father’s re-marriage, MDL was grateful for a new companion. MDL was a survivor, and he was intent on doing the best he could to carry on. Life after the war in Floyd County stabilized quickly, due in large part to the economic expansion driven by the cotton trade. Rome Georgia is situated at the convergence of the Etowah and Oostanaula rivers, and the neighboring town of Armuchee benefited greatly by the merchant traffic of that river port. MDL was an experienced cotton farmer, and likely joined with his step-father Benjamin in raising cotton to take advantage of the economic expansion of the area. MDL and Nancy Elizabeth’s family was also growing. Daughter Ophelia Hannah Emaline Reid, named after her grandmothers, was born on 27 May 1871. On 27 Jan 1873, not long after Ophelia’s birth, son Green R. Mark Zealous Reid was born. On 15 Oct 1874, daughter Julia Nettie Camilia Reid came to the family. For MDL, life in Armuchee was good, but it was about to take another dramatic turn. 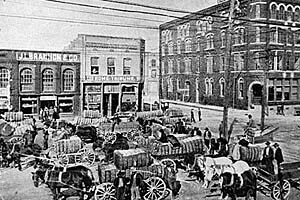 One day in early 1877, MDL went to town to fetch supplies. As he was going about his business there, he noticed a bit of a commotion. To his surprise and disappointment, he observed that two Mormon missionaries were being harassed by a group of local townsmen who were preparing to tar and feather the men and run them out of town. MDL could see that the men were in trouble, and if left unaided, he knew that they would be seriously harmed. Compelled by his sense of good will, and perhaps inspired further, MDL was somehow able to create a distraction sufficient to sneak the missionaries away and take them to the safety of his home. When he arrived at home, MDL introduced the men to Nancy, and told her the story of their rescue. Nancy was upset to learn that the men MDL had rescued were Mormon missionaries. She knew of their reputation, and the persecution that Mormons were subjected to in the area. Fearing for the safety of her family, Nancy implored MDL to send the men on their way, but MDL insisted that they first feed them and care to the injuries they had sustained in their altercation earlier in the day. Still angered by the situation, Nancy grabbed a pail and left the house to fetch some fresh water from a nearby spring. As she was stooped to draw water from the spring, Nancy was approached from behind by someone who tapped her on the shoulder. Startled, she turned to see an older man with a white beard and shinning white hair who announced to her that the men in her home were servants of God and that she and her family would do well to allow them in her home and to care for them. Nancy’s attention was turned again to drawing water from the spring, and when she looked back to continue her conversation with the man, he was gone. Nancy returned to the house and told MDL what had happened. While Nancy was off gathering water, MDL had engaged in conversation with his missionary guests. Undoubtedly they spoke of many things, but ultimately, the discussion would turn to religion, and the unique elements of the missionary’s faith. Nancy’s visit from the stranger confirmed what MDL was feeling. These men were special, and MDL knew that he and Nancy needed to listen to their message. Later that evening, Nancy’s earlier fears were confirmed. 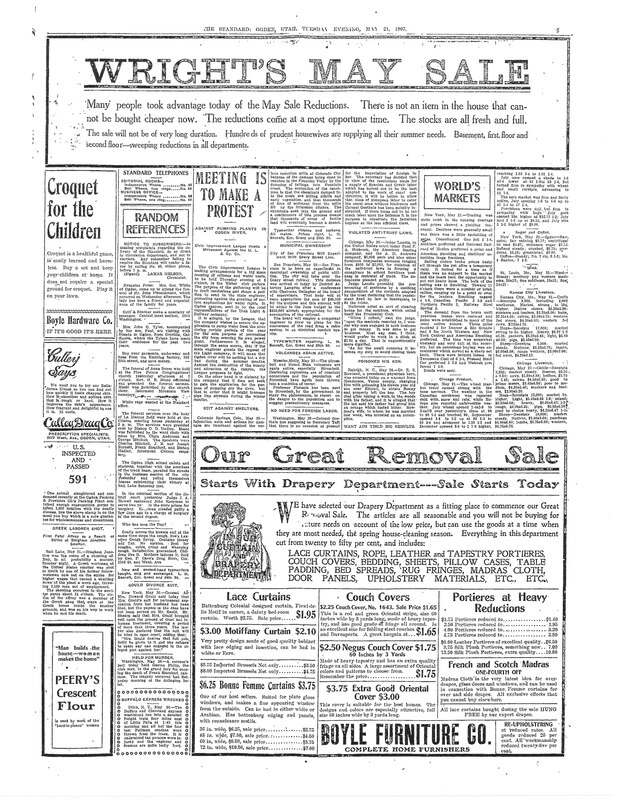 A group of men arrived at the house demanding that the missionaries be turned over to them. MDL took a position at the door with rifle in hand and made it clear to the men that he had no intention of turning them over to the group. MDL stated firmly that, “these Elders are my guests. They haven’t harmed any of you and you are not going to harm them until you have killed me, and before you kill me I’ll kill some of you. Now go on home”. The mob of men could see that MDL was intent on defending his guests, so the group dispersed and left without further incident. From that experience, MDL and Nancy became interested in the Mormon faith. Elder John Morgan and his companion remained to teach them, and on 10 February 1877, MDL and Nancy were baptized. In the brief time of their visit, MDL and Nancy became endeared to those missionaries, and the missionaries to them. MDL had rescued them from harm’s way, and Nancy had provided for their care. John Morgan, and his missionary companion, had given MDL and Nancy an even greater gift, the gospel of Jesus Christ. After MDL and Nancy were baptized, the missionaries went on to Rome. Not long after, they returned to assign MDL the responsibility of leading the small congregational branch of members living in Armuchee. Unbeknownst to MDL and Nancy at the time, this would not be the last time they would see Elder Morgan or be affected by his influence and leadership. Elder Morgan was equally unaware at the time, but as his role in LDS Church leadership evolved, he would later return to Georgia to preside over the Southern States Mission while MDL and Nancy resided there. His leadership and influence in that capacity would have a profound affect on MDL and his descendents. Life in Armuchee after Elder Morgan’s visit continued to be challenging and rewarding. It was only four months later on 6 Jun 1877 that Nancy and MDL’s second son, their fourth child, was born. As is LDS tradition, infant children are given a name and a blessing soon after their birth. So great was their love and respect for Elder Morgan, that Nancy and MDL choose to name their new son, Charles Morgan Reid in honor of Elder Morgan, who blessed their new son on 13 Oct 1877. It was not the last time that the Morgan name would be given to a descendent of Nancy and MDL, but Charles was the first, and he bore the name proudly. Not long after, on 15 Nov 1878, another son, George Washington Bailey Reid was born. Then on 22 Nov 1881 their youngest child, Walter Laurel Reid was born. The family was growing steadily. Ellen had recently remarried and moved on, but MDL’s mother Hannah had returned to live with him after his step-father Benjamin’s death. 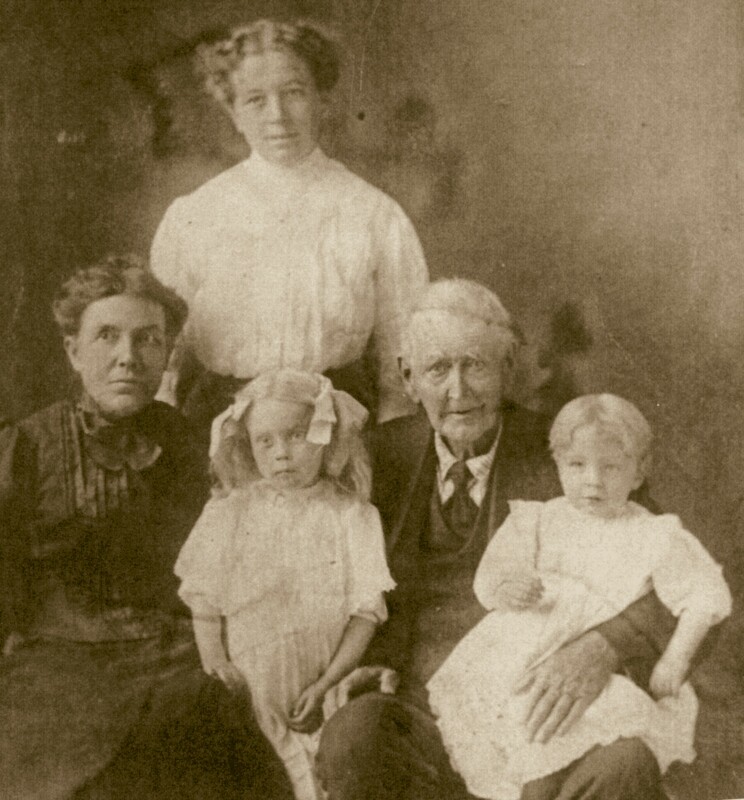 Nancy and Hannah cared for the children while MDL continued to labor with the farm and tended to his responsibilities of leadership of the Armuchee Branch of Mormon faithful. So complete was their conversion and commitment to the Mormon faith, that MDL and Nancy maintained a home for the Mormon missionaries serving in the area. Doing so subjected MDL and his family to the constant threat of persecution and disregard by their neighbors, yet they were unwavering in their faith and commitment. 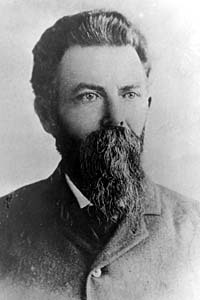 Likely in response to persecution and encouragement from church leaders, in November of 1885 MDL made the decision to move his family west to Utah. In spite of whatever religious persecution MDL and his family were enduring at the time, it would have been a difficult decision to make to abandon the lush hills of Georgia for the desert of Utah. 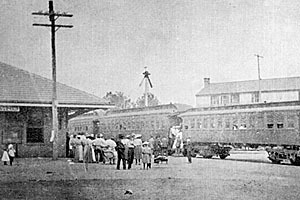 Once committed, MDL gathered the family together, including mother Hannah, and made the necessary arrangements to travel west to Utah by train. Some advanced preparation may have been made for MDL’s family to be received in Utah, but they arrived in Kaysville, Davis County, Utah without any connection to family or friends other than what their association with local Church members would provide. At nearly 60 years of age, MDL was once again challenged to begin anew. MDL initially settled the family in Kaysville after their arrival. On 1 Dec 1887, MDL’s mother Hannah died. 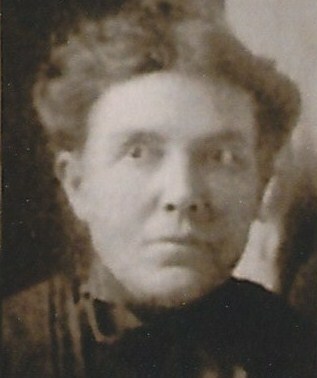 She is buried in the Kaysville Cemetery, likely nearby where MDL lived at the time. In 1892 MDL moved the family to the “Sandridge”, now Clinton, Davis County, Utah to lay claim to property available to homestead. By 1900, census records indicate that he owned the home they were living in and that he was engaged in farming. Not long after their move to Clinton, the challenges of life’s many difficult years were finally beginning to be manifest. MDL was growing weak, and on 18 May 1907, at age 77, he died at his home in Clinton. 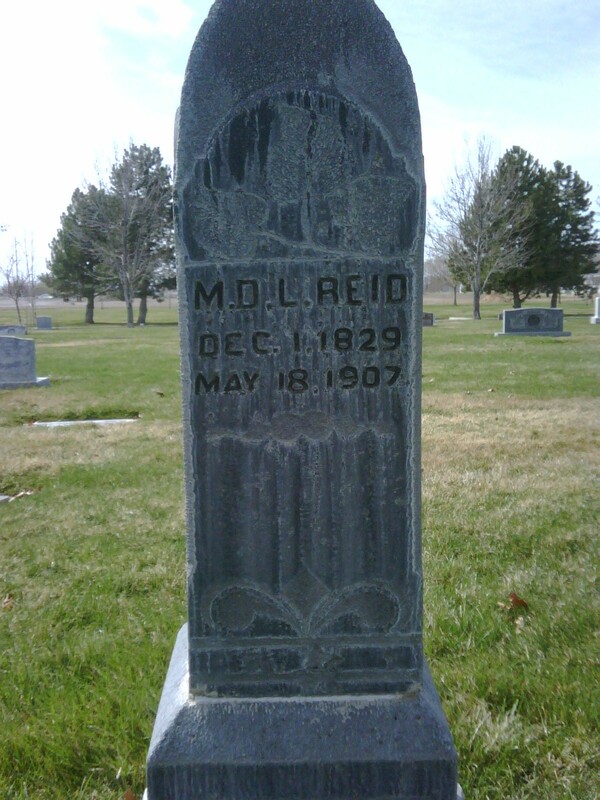 MDL was buried in the Clinton City Cemetery in Davis County, Utah. Today, a stately marker stands by Marcus D Lafayette Reid’s grave to remind his ancestors of the resting place of a man who repeatedly put concern for his personal welfare aside to protect family and neighbors, and to embrace the Gospel of Jesus Christ. A man whose courage, perseverance, and devotion to family and his God are worthy of emulation by all who shall follow him. Indeed, his namesake Marquis d Lafayette, would have been proud that MDL bore his name; as are we, his ancestors, proud to bear the Reid name.